VLESP informs and advices about suicide, suicide prevention, postvention and mental health promotion. Additionally, VLESP acts as an advisory body for the Flemish Government and for organisations working in suicide prevention and postvention. A lot of information on suicide prevention, postvention and mental health promotion can be found on www.zelfmoord1813.be. For other questions, you can reach us via info@vlesp.be. Developing and creating new methods and tools for the promotion of mental health and the prevention and postvention of suicide. Click here for an overview of our projects. Encouraging and monitoring the dissemination of these methods and materials in Flanders. Offering support and advice to organisations and stakeholders who want to develop new suicide prevention or postvention initiatives. Staying up to date with new developments in suicide prevention and postvention. All methods and tools are available at www.zelfmoord1813.be. More information can be found on the Projects and Publications pages. For other questions, you can reach us via info@vlesp.be. VLESP contributes to the implementation of methods and tools on suicide prevention, postvention and mental health promotion. Registering and monitoring the latest epidemiological trends and developments. Leading the evaluation of the actions within the Flemish Suicide Prevention Action Plan and suggest adjustments, where necessary. Communicating about the different actions and the Flemish Suicide Prevention Action Plan to the general public. Monitoring the pre-conditions of the Flemish Suicide Prevention Action Plan. 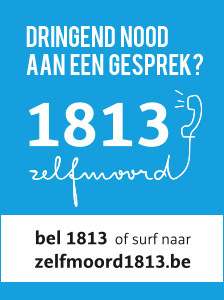 More information about suicide prevention can be found on www.zelfmoord1813.be. For other questions, you can reach us via info@vlesp.be.